Dark circles around the eyes don't have to be a pain to deal with. There are a ton of eye creams on the market to help reduce the appearance of them and a good concealer on top can help to hide the rest. What can be even easier though is one product that does both; a one step wonder product. Very fitting then that today's product even has the word 'wonder' in the name! Balance Me's Tinted Wonder Eye Cream is a variation on the original Wonder Eye Cream with the added benefit of helping to cover dark circles as well as helping to reduce them. In addition, it also gets to work on fine lines. It is 99% natural and combines cream and light reflecting pigments to help blur dark circles and reduce fine lines. It contains cucumber seed oil to gently cool, calm and reduce puffiness as well as moisturise and brighten; rosehip oil, a fantastic oil that helps to cell renewal and arctic cloudberry seed extract that is anti-oxidant and Vitamin E rich to help protect against environmental damage. Balance Me also claim that this Tinted Wonder Eye Cream is also suitable for all skin tones. It comes packaged in a white squeezy tube that comes in 5ml and 10ml sizes. The cream itself is thick and looks like a liquid concealer or foundation at first sight. It also has a light, clean fragrance. To apply, dab a small amount around the eyes onto clean skin. Balance Me say that patting the cream in is better to drain away the toxins, working from the top of the eye out towards the corner. For under the eyes, begin from the outer corner and work towards the nose. 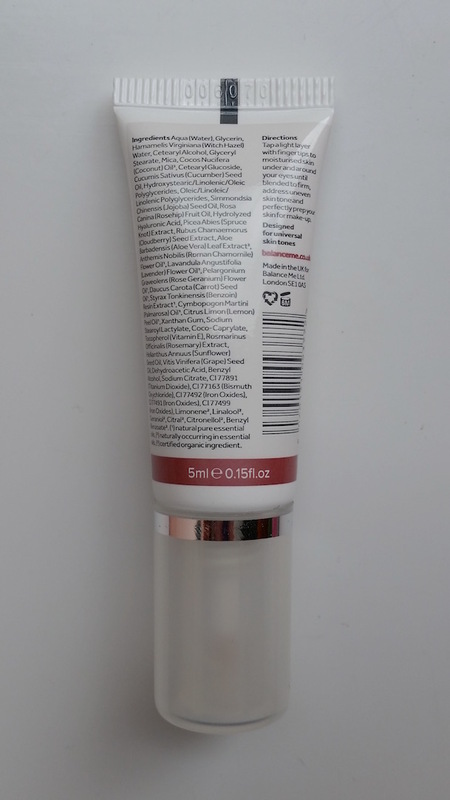 Whilst the cream looks thick when you first squeeze it out of the tube, the coverage is light. It covers dark circles well though with a natural looking finish. This eye cream is perfect for no-makeup days. The light cover it provides helps to look like you've made some kind of effort when in reality you aren't wearing any makeup at all. It also makes a pretty good makeup base. You don't need to use as much concealer around the eyes thanks to the tinted aspect. In regards to the actual skincare benefits of this cream, I find that it works just as well as the original Wonder Eye Cream which is one that I love and recommend. It helps a lot with dark circles and is fab with reducing the appearance of fine lines. It absorbs easily too so you won't be there for a long time patting it in to the skin. Just like the original Wonder Eye Cream though, I find this more comfortable to wear in the daytime. I find that it irritates my eyes somewhat when used at night (maybe due to tiredness), but I don't have this problem in the day. I don't appear to be the only one with this irritation issue either and past comments from people on this blog have said the same, but at the same time there are a lot of people who have no issues. I don't find it to be a problem with this particular cream though as I don't need a tinted eye cream at night time, but I thought that it was worth mentioning. Overall, I am a really big fan of this Tinted Wonder Eye Cream. I love the skincare benefits as well as the coverage you get, so it makes a great product to streamline your routine. All I wish is that I hadn't just recently discovered this eye cream. I definitely could have done with this when I first became a parent, that's for sure! You can purchase the Balance Me Tinted Wonder Eye Cream from Look Fantastic. 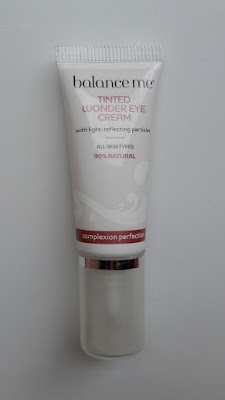 What are your thoughts on the Balance Me Tinted Wonder Eye Cream? What is your favourite eye care product? I have been trying it for some time and I would say that its the best thing amongst its related products. Your review of the product is really brief and comprehensive. Highly recommended to everyone.